Patient Safety Behavior in Physicians: How is it Predicted? Background: Patient safety is a serious global public health issue. Estimates show that every day many patients are harmed while receiving hospital care. Health care staff plays a key role in providing quality and safe patient care, especially physicians who are main members of the medical team and a critical element in patient safety efforts. Objective: The current study used a Theory of Planned Behavior (TPB) framework to investigate predictors of patient safety intentions and behavior of physicians. Methods: This descriptive analytical study was conducted in 8 hospitals with 52 physicians participating. A researcher-designed questionnaire was prepared to investigate patient safety behaviors and behavior constructs of physicians based on the guidelines of constructing a TPB Questionnaire: Conceptual and Methodological Considerations. The content validity and reliability of the questionnaire were confirmed. Binary logistic regression analysis was performed using SPSS18. Results: The total mean score of physician safety behavior indicated that 3.8±0.92. 42% of physicians reported their safety behavior at a good level. There was no significant difference between the patient safety function of physicians in public and private hospitals (P=0.8) and working in medical or surgical wards (P=0.4). Among TPB constructs, “normative beliefs” had the greatest influence on physician intention for safety behaviors (wald=3.828, P=0.05). Conclusion: The results showed that “normative beliefs” had the greatest influence on physician intention for safety behaviors; therefore, it seems that patient safety must be the most important concern of all health care staff, specifically managers and executives throughout health care centers. Organizations JCoAoH. Facts about patient safety WHO 2002 [cited 7]. Available from: http:// www.who.int/ features/ factfiles/ patient_safety/en/. Sutker WL. The physician's role in patient safety: What's in it for me? Proc (Bayl Univ Med Cent). 2008;21(1):9-14. Steiger B. Special report: quality of care survey. Doctors say many obstacles block paths to patient safety. Physician Exec. 2007;33(3):6-14. Brier R, Corrigan J, Donaldson M, Kohn L. committee on quality of health care in america, institute of medicine. Crossing the Quality Chasm: A New Health System for the 21st Century Washington, DC: National Academies Pr. 2001:25-6. Majidi SA, Ayoubian A, Mardani S, Hashemidehaghi Z. A survey of the quality of nursing services for brain trauma patients in the emergency wards of hospitals in Guilan Province, Iran (2012). Electron Physician. 2014;6(1):747-53. Ajzen I. Constructing a TPB questionnaire: Conceptual and methodological considerations. 2002. Gharlipour Z, Ghaffari M, Hoseini Z, Heidarabadi AB, Tavassoli E, Hozuri M, et al. Investigation of educational intervention based on Theory of Planned Behavior on breakfast consumption among middle school students of Qom City in 2012. J Educ Health Promot. 2015;4:39. Cook RI, Woods DD. Operating at the sharp end: the complexity of human error. Hum Error Med. 1994;13:225-310. 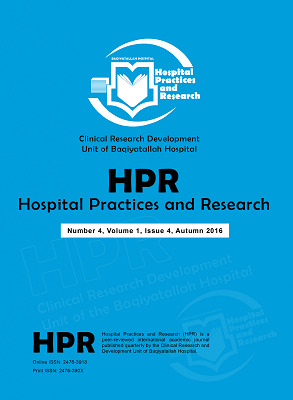 Yaghoubi M, Rahmati-Najarkolaei F. Patient-physician communicative patterns, physicians’ job satisfaction, and patients’ satisfaction: the case of a hospital in Isfahan. Iran J Health Sci. 2014;2(2):37-44. Kohn LT, Corrigan JM, Donaldson MS. To err is human:: building a Safer Health System: National Academies Press; 2000. World Health Organization. Word Alliance for Patient Safety. Guidelines for safe surgery: safe surgery saves lives [Internet]. Geneva; 2009 [cited 2013 Feb 22]. Pooreh S, Hosseini Nodeh Z. Impact of education based on theory of planned behavior: an investigation into hypertension-preventive self-care behaviors in Iranian girl adolescent. Iran J Public Health. 2015;44(6):839-47.